"The church would rather ignore a miracle than validate a sham." Music Box Films has released an official US trailer for an indie religious drama title The Apparition, which premiered at a few minor film festivals earlier this year. The latest film from French filmmaker Xavier Giannoli (of When I Was a Singer, In the Beginning, Superstar, Marguerite), the story is about a journalist who is sent by the Vatican to investigate a young girl claiming to be visited by the Virgin Mary. "Jacques gradually uncovers the hidden motivations and pressures at work and sees his beliefs system profoundly shaken." Vincent Lindon stars as Jacques, and the cast includes Galatéa Bellugi, Patrick d'Assumçao, Anatole Taubman, Elina Löwensohn, Claude Lévèque, Gérard Dessalles, Bruno Georis, Alicia Hava, as well as Candice Bouchet. Even though the title makes this seem like a horror, it's much more of a religious thriller with some unique twists. Jacques (Lindon) is a journalist at a large regional newspaper in France. His reputation as an impartial and talented investigator attracts the attention of the Vatican who recruits him for a special task; taking part of a committee to investigate the veracity of a saintly apparition in a small French village – a true canonical investigation. Upon his arrival, he meets the young and sensitive Anna who claims to have personally witnessed the apparition of the Virgin Mary. A profound devout, she’s garnered an impressive following in the village and is torn between her faith and the many solicitations she receives. Confronted with opposing views from clergy members and skeptics in the group, Jacques gradually uncovers the hidden motivations and pressures at work and sees his beliefs system profoundly shaken. 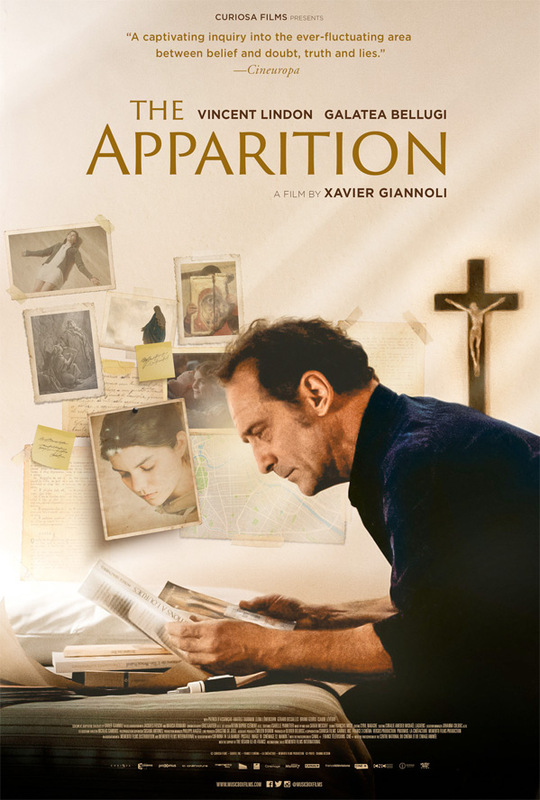 The Apparition is both written and directed by award-winning French filmmaker Xavier Giannoli, of the films Eager Bodies, Une aventure, When I Was a Singer, In the Beginning, Superstar, and Marguerite previously. This first premiered at the Moscow and Edinburgh Film Festivals. Music Box Films will release Giannoli's The Apparition in select US theaters starting on September 7th coming up next month. Is anyone interested?